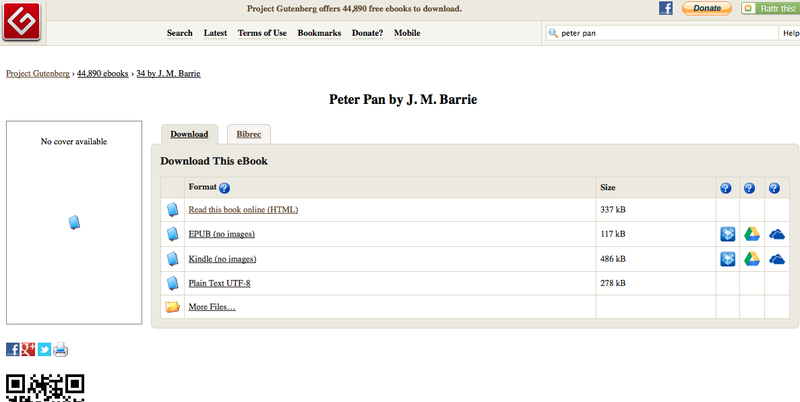 I chose a digital version of the text, Peter Pan. I found it on the Gutenberg website. This website is a collaborative project that allows people access to numerous works of literature through digital means. They have digitalized thousands of works that are in the public domain. We actually used the site to help us pick which work we wanted to do our project on. When I first accessed the work, I was given different options of how I wanted to view the text. This was interesting because it allows for very different types of reading. They have HTML versions as well as other versions such as PDF and Kindle files. Even though these electronic versions are very similar, they do produce different reading experiences. The version that I chose was the HTML version of the text. This meant that I had to read the text through my laptop and I was not in fact owning a copy of the story. On the other hand the PDF and Kindle files could be downloaded to Dropbox, Google drive, the cloud, and ones own computer. By picking these options it allows for a reader have direct access anywhere and does not require a computer or internet access like the HTML version. The link gives a brief explanation of what the Project Gutenberg is and explains why people are given access. 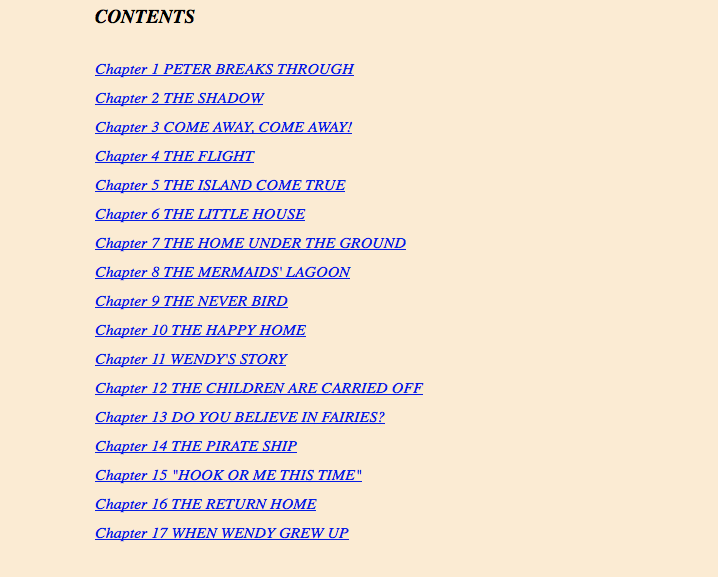 Then the reader is given a list of chapters that are blue hyperlinks. This is important because it allows for the reader to jump around the page and keep their spot in the text after leaving the page. If you continue to scroll down the reader is taken into the story. The hyperlinks jump to a spot on the page but one does not need to use them to navigate the different chapters of the story. One can simply continue scrolling. I have found this the most accessible of the different types of media, because I do not need to own a physical copy of the text nor do I need to have a special device to view the text. The only complaint I have with the text is the spacing of the actual text. The text could have been more spaced out allowing for easier reading but all and all it was a well made and easily accessible website. Another adaptation of the text can be seen in the animated film version of the story. The version I looked at was the animated Disney film from 1953. I was surprised at first that it was made so long ago as I fondly remember viewing it as a child in the late 90’s. The film follows the same text as the story for the most part. It has the same characters and plot points. Clyde Geronimi, Wilfred Jackson, and Hamilton Luske directed the film. It was produced by the ever talented Walt Disney. It was a major success and is still loved today. This film is what inspired me to want to read the book. The way the story is presented is perfect for both children and adults. That is part of the draw for a animated classic such as this. The movie allowed millions of people access to a story they might have otherwise not had any contact with. The ability to take reading out of story telling and add orality and visual aspects is key in creating an easily accessible story. This is what sets this version of the work apart from others. 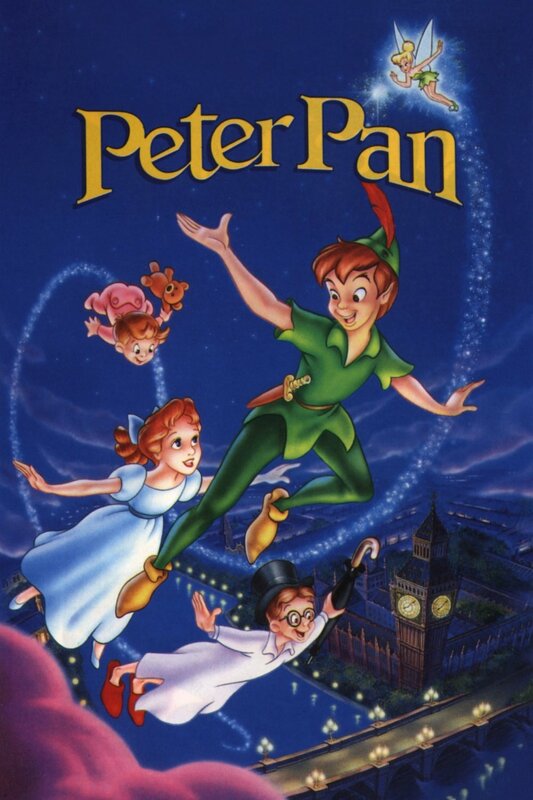 This version of Peter Pan is in an online comic book form. It obviously omits much of the original text and instead provides pictures that help to tell the story. A majority of the original dialogue, however, is kept and the comic follows the standard plotline very closely. The audience that this version is geared towards would be a younger demographic, especially when considering that it is accessed online. Comics are the most popular with teens and tweens. Reading this version of the text would be a vastly different experience than reading the original book because of the illustrations. Because books rely heavily on imagination of the reader, a closely illustrated version would ensure that readers have a more standardized experience of the story. In the transition from print to online comic, a lot of the specific descriptions are included, which I found surprising because it gives the comic the feel of a book in reading but a comic in physicality and presentation. It is an interesting combination of text, dialogue, and animation. It is similar to a movie because you are watching a picture instead of imagining one in your head and holds on to the descriptions that can’t be shown, much like a narrator that voices over in certain movies. I chose the original play on which the novel is based. 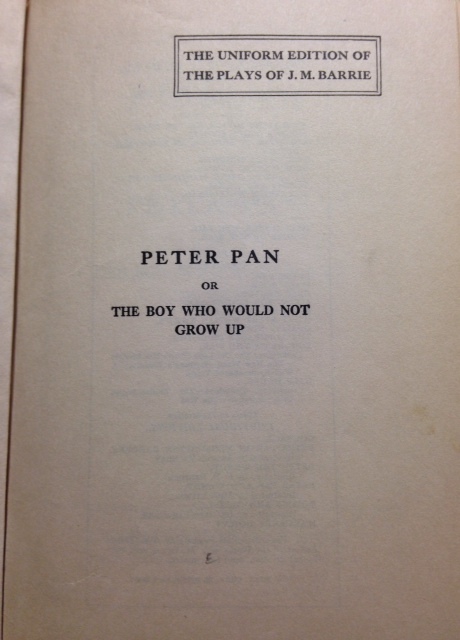 In terms of content, this version has two titles, or rather a main title and a subtitle: “Peter Pan; or The Boy Who Would Not Grow Up”. This difference in title suggests that since the play preempted the novel, the readership of the novel would have been familiar with the play. Also, J.M. Barrie might have desired to distinguish between the two works by leaving the second title off of the novel. Interestingly, the way Barrie describes the setting in this version before each scene starts reads more like the exposition of a novel. 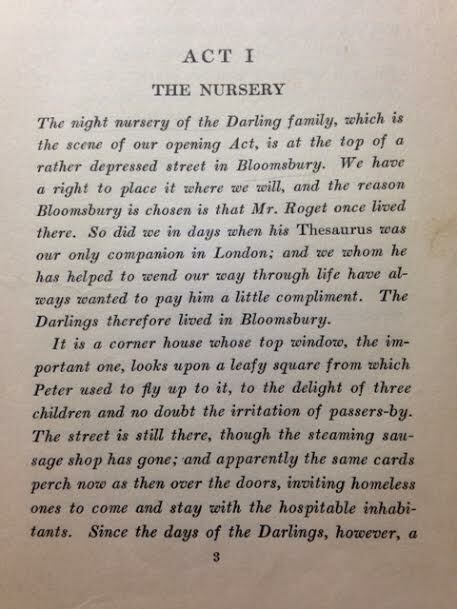 Instead of just giving information about how the stage is set, it provides backstory as to why this particular setting has been chosen, as is the case of the Nursery in Act I. The stage directions also were written with in a narrative style: “So we may conclude that WENDY has told them to wait outside until she explains the situation to her mother…” (Barrie 155). To me, it seems that Barrie assumes that his audience would be reading the play as much as watching it, and I think it is meant to be read as well as performed because of this combination of the elements of a novel and a play. There is, however, less narrative description of action in the play, and it lacks any sort of illustration. It leaves lots of gaps that must be filled which makes reading this version slightly more of an effort, and thus might not be intended for a younger audience to read on their own; rather, the play version seems to necessitate being seen by younger audiences and read by older audiences. This lack of description allows for more ways in which the action can be imagined (in the reader’s mind) and interpreted (on stage). It definitely differs from the graphic novel in this way, as well as from versions that include illustrations of particular moments (see the Nook version below). Lastly, the text of the play also lacks any editorial notes or introductions; however, it does include the dedication written by Barrie. 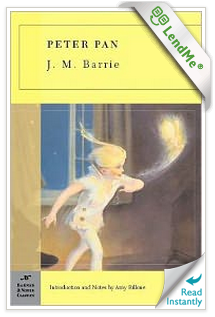 The digital version of the Barnes & Noble Classics edition of Peter Pan is accessible not only just on the nook but on other devices like the computer or a smartphone (with the nook app) as long as one has a B&N account. It advertises itself as being able to be read “instantly”. this version also includes an introduction and notes by Amy Billone. The notes are separated into two sections: notes on historical information and those defining certain terms. 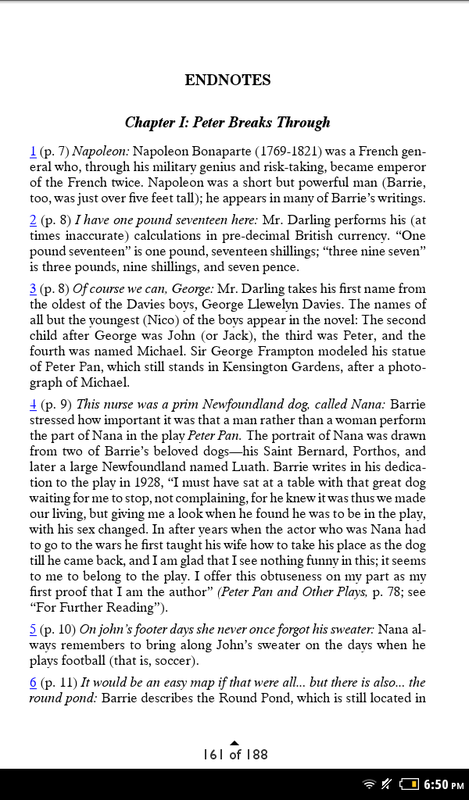 One can navigate to these notes by clicking on the linked numbers or letters in the text, which send the readers to the back of the book. In order to get back to the text itself, there is a “Back” button. This is a convenient way to navigate notes, which are less easily accessible during a reading session of a print version. 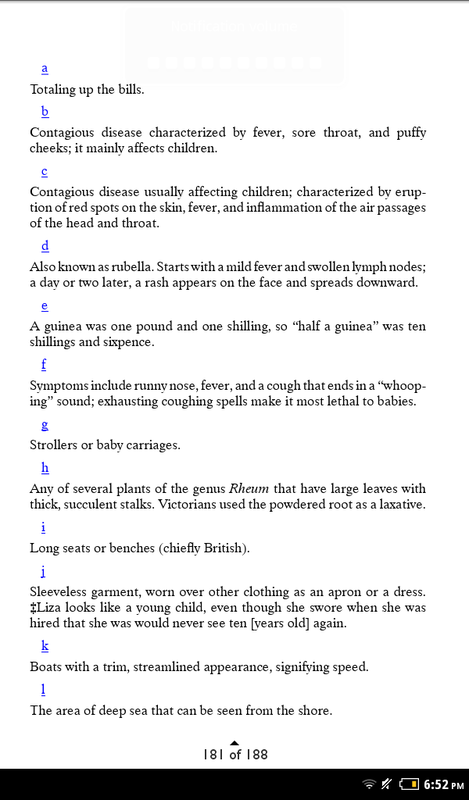 The Nook version also includes suggested study questions and illustrations by F.D. Bedford of particular scenes. 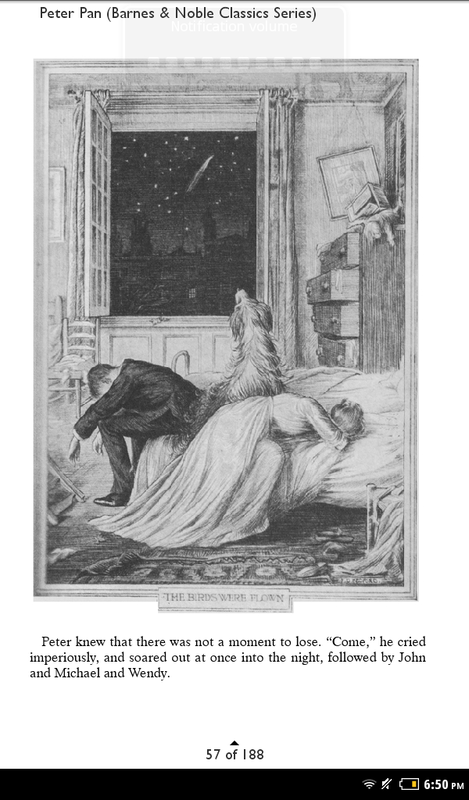 These illustrations are not extensively provided; only the most important plot points seem to be illustrated. This says something about the intended readership. It is neither exclusively for children (though it is a children’s book) nor adults. It is marketed for a mixed audience; while the illustrations cater to the interests of younger individuals, the informative notes, and even some suggested study questions, gear the novel toward an older audience who may intend to study the work academically. 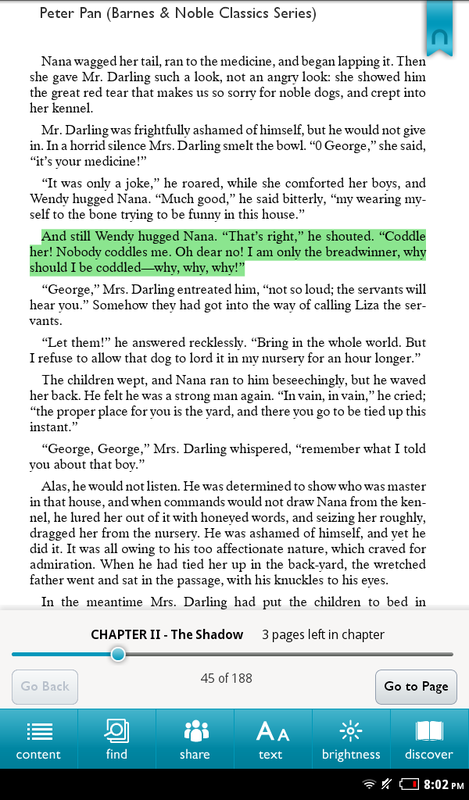 Reading the Nook version allows one to search for specific words or phrases easily using the search tool, to make notes and highlight passages, and to bookmark pages, among many other features. Additionally, unlike print versions, the individual reader can customize how the pages look; this personalization of the experience of reading (increasing screen brightness, making the font bigger or smaller, etc.) makes the text easier to read at the individual level. These features provide easy navigation, making reading more efficient than on other e-text versions like the Gutenberg Project’s, and they individualize the reading experience. 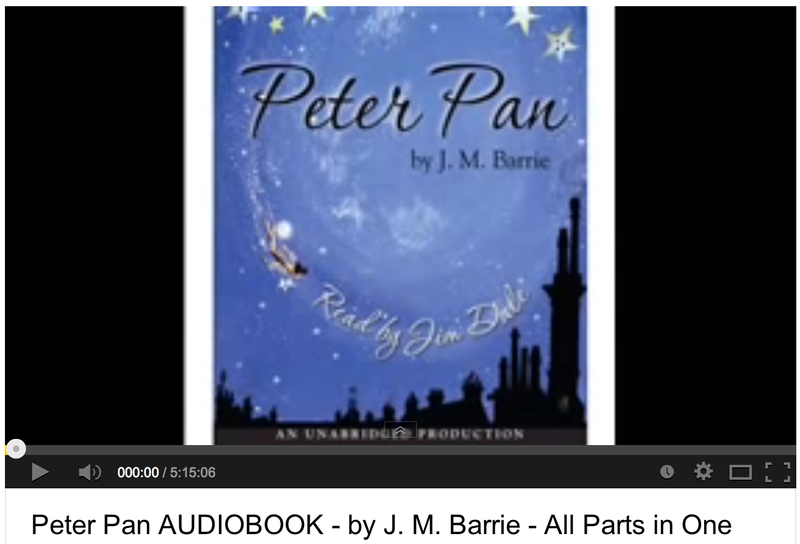 I also listened to part of an audio-recorded version of Peter Pan – it is read form the original text, so this version does not stray from the storyline. Audiobook seem to be most popular with the older generation because of the ease of use. It is unlikely that a young (under 30) person would sit down to listen to an audiobook or even listen to one in the car. I think that the way that an audiobook is consumed is very different than if you read the book yourself – reading requires more concentration. Your attention is much more likely to wander when listening to an audiobook and few people listen as a singular activity – it is often more of a background noise to the other activities they are doing. This dilutes the experience of the story. Details are more likely to be lost and the listener (at least in my experience) doesn’t form the same kinds of attachments to characters.